As affordability varies user to user and therefore, everybody has a certain level of budget allocation for their purchases. Though budget is limited, but everybody wants the maximum outcomes from their purchased products. With so many options, it is troublesome to find out the highly efficient juicer within your budget. For being a mom and homemaker, I tried several types of juicers in the past few years. I have made the following list of the best budget juicers based on my practical experiences. The list contains juicers of a variety of features so that you can choose the most suitable one that can fulfill your needs. Among many of the cheap but best juicers, the Breville BJE200XL Compact Juicer comes out on the top. Its unique extraction system and lowest preparation time will make your juicing just fun. Juicer Body Materials: Juicer body is made of heavy grade polymer that ensures long-life without losing any quality. It comes with stainless steel cutters and micro mesh filter. All other parts of the juicer are made of BPA free plastic. 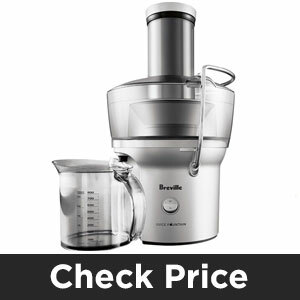 Space/ Dimension: The Breville BJE200XL juicer measures 9-1/2 inches by 8-3/4 inches by 16 inches. It has 700 watt motor that operates the juicer on average at 14,000 RPM. The 3-inch centered feed tube can process whole fruits with maximum extraction. Juicing Ingredients: Almost, every type of fruits and vegetables can be juiced with this amazing juicer. I tried a large variety and was able to juice apples, carrots, oranges, plums, peaches, berries, pears, grapes, tomatoes, etc. As it is a centrifugal juicer, it may give you a bit lower yield. Juicing Leafy Greens: The booklet that comes with the juicer doesn’t mention any specific ingredients that can be juiced with this juicer. However, I tried kale, spinach and chard; I am satisfied with the yield. Juicing Soft Fruits and Vegetables: Actually, I got more success with soft fruits and vegetables. Watery fruits give more yield and I think, the juicer works with them more friendly. Sound: You can find some sounds but you will not be bored at all. It produces a bit more sound when juicing leafy greens. Cleaning Time: Cleaning this juicer is like fun. You don’t need more than 5 minutes to clean it completely. Replacement Parts: If you need to replace blade, juice jug or any other parts, you can buy them from Amazon or Breville brand website. Warranty: Comes with a limited 1-year warranty. This juicer comes at the first among most of the slow juicers I have used. My experience says it gives more outcomes than other best affordable juicers. This simple but highly efficient juicer will not cost you crazy amount of cash. Juicer Body Materials: Aicok Juicer is made of entire healthy materials. Most of the parts are made of ‘nontoxic’ steel. BPA free plastics are used in the juicer that produces proven healthy juices. The 7 segment spiral system enables it producing more juice yields, less oxidation and the highest nutrition. Space/ Dimension: The juicer comes with a suitable dimension of 17.1 x 13.1 x 8.9 inches. It weighs 12.1 pounds. Slow masticating and grinding machine operates with only 80RPM ensures smoother yields and 90% more nutrition growth. 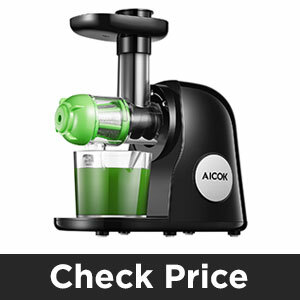 Aicok Slow Juicer is foaming-free as well as clogging-free juicer. Juicing Ingredients: You can perfectly juice almost any types of fruits and vegetables from banana to spinach. The large auger allows you to squeeze and chop whole fruit. Instead of only juicing, this best value juicer is able to make nut butter, sauces, soy milk and even baby food. Juicing Leafy Greens: Does the juicer squeeze leafy greens and fibrous vegetables? It is a common worrying question of almost all homemakers. I can remember I juiced kale, celery and spinach. So, don’t worry you can easily juice leafy greens. Juicing Soft Fruits and Vegetables: It handles soft and watery fruits perfectly well. I got perfect juice yields from melons, blueberries, strawberries. Sound: It never bored me with useless and sickening sounds. Additionally, without creating more heats and friction it saves all essential nutrients in your juices. Cleaning Time: I know some of my neighbors and friends who like this masticating juicer because of its easy assembly system and less cleaning time. Replacement Parts: Replacement parts are available in various online stores including Aicok brand store. You can purchase if you need in any stage of using. Warranty: The juicer received UL, ETL certification by using advanced juicing technology. It comes with general 2-year warranty and 1-year extra warranty under specific circumstances. Users will receive lifelong customer service and technical consultation. Breville JE98XL Juice Fountain Plus is simple and no-nonsense things are attached with this juicer. You can easily get yourself in the healthy world of juicing with this best affordable juicer. It features an efficient motor, dual speeds, faster operation and easy clean-up. Juicer Body Materials: The juicer has a heavy grade polymer body for stability. All materials that exposed to food or pulp are BPA-free. Central feed system is for maximum extraction. Stainless steel blades and mesh filter basket ensure safe use. Space/ Dimension: Breville JE98XL juicer has a large dimension of 13.2 x 16.5 x 18.2 inch. It weighs not more than 15 pounds. Juicing Ingredients: This is the best budget juicer for all types of vegetables, fruits and berries. It has 3 switch positions that control speed for juicing various types of ingredients – no matter soft or harder fruits. Juicing Leafy Greens: For a regular juicer who juice wheatgrass and leafy greens, Breville JE98XL might not be a perfect choice. It can juice leafy greens but with lower yield. Juicing Soft Fruits and Vegetables: The lower speed setting (6,500 RPM) can juice any soft fruits and vegetables. My experiment with cantaloupe, pineapples and raspberry was really noticeable and the yield was very fine. Sound: The juicer runs at two different speed level 6,500 RPM and 12,000 RPM. No doubt, it is a high-speed juicer. The juicer actually vibrates and makes enough noise when juicing. Cleaning Time: There are few parts in this juicer to clean. You may need maximum 5 minutes to properly clean the juicer. Replacement Parts: Breville brand shop contains all parts separately. If you need, you can purchase them from their website. Warranty: You can buy this inexpensive juicer with a 1-year limited warranty. I really like masticating juicer because of its controlled speed and gently grinding system. Omega J8006HDS juicer is one of the best juicers of Omega 8000 series and of course, it is a quite cheap juicer of the series. 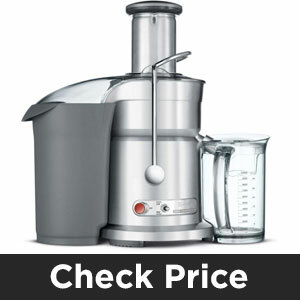 Juicer Body Materials: The Omega J8006 model is an upgraded version of previous J8004. All the plastics that come in contact with food are BPA-free. The 2-stage screen is made of stainless steel. Of course, the entire body is more stable and ‘heavy duty’. It has less possibility to screen damage after a longer use. Space/ Dimension: The juicer dimension is 14.5 x 6.5 x 15.5 inches and the weight is 13 pounds. I don’t think it is too unexpected in size, but to someone, it may be larger. Juicing Ingredients: I tried to juice soft and hard produce, citrus fruits, leafy greens, nuts and beans. Every time, I was pleased with the result. Juice was really good and pulp was very dry. If you think the pulp has some more juice, you can put that into the chute again. Hard produce like pear, cilantro, sweet potato, pepper, garlic, apple, ginger, and carrots gave me amazing juices. You can make almond milk and soy as well. Juicing Leafy Greens: I juiced most of the leafy greens including kale, peppermint, spinach, dandelion greens, cabbage, basil, lettuce, collard greens, wheatgrass and beet greens. Overall, you will never face any issue to juice leafy greens and fibrous vegetables. Juicing Soft Fruits and Vegetables: I tried soft fruits such as strawberry, cranberries, blackberry, tomato, grapes, mango, melon, kiwifruit, and peach. All these soft fruits can be turned into pure nutrients easily by the Omega J8006. Sound: The noise level is lower. The machine runs at 80 RPM that means it reduces oxidation and generates less noise than any centrifugal juicer. Cleaning Time: After completing juicing, cleaning the parts is mandatory. You need 5 minutes to rinse and wash the juicer’s parts. Replacement Parts: If you need to replace any single part, you can do it easily from the Omega brand website. 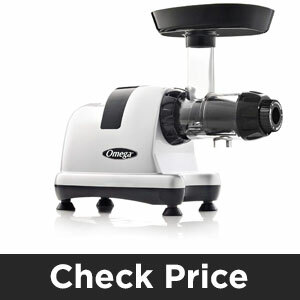 Warranty: Omega J8006HDS gives the highest years of warranty among all the juicers I have reviewed here. It comes with a full 15-year warranty. Looking for a juicer that packs a punch and is easy to maintain? 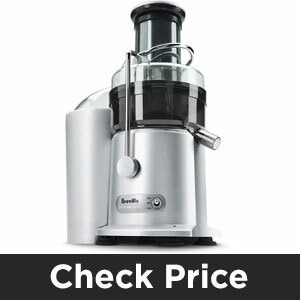 How about something that is one of the best value juicer with perfect features? The Breville 800JEXL Juice Fountain Elite might be the answer. Let’s find out the reasons behind the answer. Juicer Body Materials: Most parts of the Breville 800JEXL Juice Fountain Elite is made of high quality stainless steel. Rest of the juicer is made of PBA free plastics. It has titanium reinforced cutting disc. Italian micro mesh filter gives you quality juice with natural taste. The juicer also contains 1.1qt juice jug and a larger pulp container. Space/ Dimension: I used this juicer when I had a small kitchen room. It measures 9″ x 16.5″ x 16″ and fits easily in any type of kitchen. Additionally, the gorgeous design of the juicer enhances the beauty of your kitchen room. Juicing Ingredients: It can juice any type of fruits and vegetables, but the yield is not always satisfactory. Pulp looks very dry that means it gives you the last drop of the juice. The machine doesn’t work well with the fruits that are not solid enough like a peach. Juicing Leafy Greens: Less juicy vegetables and leafy greens take a citable hit in juice yield when putting under the cutting edge of the juicer blades. Takes a bit more time, but it can juice ultimately. Juicing Soft Fruits and Vegetables: I noticed, it can’t handle easily lemon, orange and tangerine skin. My inquiries with berries, grapes and kiwifruits didn’t actually yield noteworthy. Sound: The very positive side of this juicer is that it doesn’t make any thorny sound. Cleaning Time: This juicer is easier and faster to clean. You will get a cleaning brush in the package. Cleaning time will not be more than 5 minutes. Replacement Parts : are available in the Breville’s brand shop. You can buy with a single click from their website when you need. 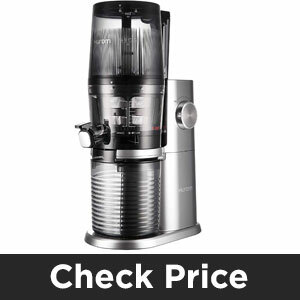 Warranty: You will get 1-year limited warranty for all the parts of Breville 800JEXL Juice Fountain Elite. Amongst various quality juicers on the market, Hurom is a popular brand name to all the serious juicers. Hurom produces different types of juices including cold press and masticating juicers. I am still using Hurom H-AI-LBB20 H-AI juicer which is a masticating juicer runs with only maximum 60 RPM. Juicer Body Materials: All the parts of the juicer are made of BPA-free materials. This is the first ever juicer comes with self-feeding system. The H-AI juicer features Alpha+ technology that ensures serious improvements to juicing efficiency. Space/ Dimension: The dimension is a bit larger and it measures 15.5 x 15 x 12.6 inches. 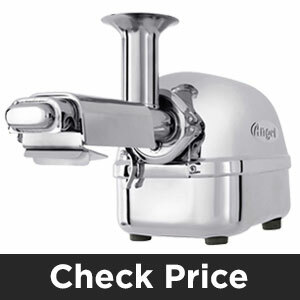 If you have used Aicok slow juicer previously, you may feel it heavier with 20.6 pounds. Juicing Ingredients: The efficient juicing chamber with 3-Degree tilt allows the juicer to juice every drop of extraction. Basically, I didn’t face any problem to juice any type of fruit and vegetable. The genuine vertical pulp container let the pulp fall straight down from the chamber. Juicing Leafy Greens: The self-feeding system of the Hurom H-AI-LBB20 gives you a comfortable juicing experience. You can easily juice broccoli, cabbage, kale and spinach. I also tried beetroot with a good result. Juicing Soft Fruits and Vegetables: If you want to juice soft and watery fruits, you can juice them effortlessly. I frequently juice strawberry and cantaloupe without facing any hassle. Sound: The machine’s 60 RPM speed doesn’t create any noise actually. Just a processing sound will not make you bored at all. Cleaning Time: Its built-in hex connector makes the assembly process very easy. Pulp clean-up takes 5 minutes and you can clean whole juicer within maximum 10 minutes. Replacement Parts: are available on Amazon and brand website. Warranty: The manufacturer provides 10 years warranty on motor and 5 years warranty on parts. The Super Angel PREMIUM DELUXE is the best among all. It costs comparatively much and gives you more satisfaction with amazing juicing. With upgraded motor, control panel and cooling system it enables you unlocking the finest juicing experience. Juicer Body Materials: The entire body of the juicer is made of food-grade stainless steel materials. Stainless steel parts don’t let the ingredients exposed to plastics and thus, keep the juice risk-free. All parts in the juicer are FDA approved that confirms healthy juicing. As it is wholly made of steel, it lasts longer than other conventional juicers available in the market. 82RPM motor speed keeps juicing yields intact with natural nutrients. Space/ Dimension: The Super Angel PREMIUM DELUXE takes a bit larger space in your kitchen. It measures of 19.5 x 7.8 x 10.5 inches and weighs 28 pounds (shipping). With the actual product weight 20 pounds, you can move this light enough juicer to in and out of your kitchen cabinets. Agreeably, it is also suitable for countertops. Juicing Ingredients: As the juicer comes with twin gear, its two-stage dual auger assure you that you will get the last drop of juice from any vegetable or fruit you are feeding into the machine. Besides juicing, you can use this for tofu, nut butter, soy-bean juice, frozen fruit sorbets and baby food. Super Angel Juicer has an automatic thermal sensor that monitors and controls the machines according to your added ingredients. Juicing Leafy Greens: This juicer can extract juice from any wheatgrass, herbs, leafy greens and sprouts. I tried broccoli, kale, cabbage, beetroot and the result was just amazing. Juicing Soft Fruits and Vegetables: About two years juicing experience with this juicer, I never find a little issue when juicing soft and watery fruits. Strawberry, cantaloupe, pineapples and raspberry gives nice juice yields. Sound: The powerful extractor machine doesn’t make any boring sound. Just a little sound I heard when juicing fibrous vegetables and I think that is not any superfluous sound. Cleaning Time: is not more than 10-12 minutes and there is no hassle to assemble it. Replacement Parts: All parts are available separately. If you need unluckily to replace anyone, you can collect from brand store. Warranty: The Super Angel PREMIUM DELUXE comes with a 10-year manufacture warranty for motor and gears, and 5-year for tear and wear. This is where you need to make decision. You have to compromise and bring out which aspects of juicer are important to you. You have lots of options in front of you; some juicers work at a high speed, some juicers give more yields – which one you want. The above list is for your quick considerations but you can find out other types. However, as I short-listed almost all types of juicers I think you will be able to find out best juicer from there.